COLONIE — After about 90 minutes of comments from the public and the Planning Board, the plan to build a 158-unit apartment complex and a 90-unit assisted living facility for seniors was tabled by the applicant. Technically, the appearance was a sketch plan review, or the first step in the process, but Radtke Family Partnership was also asking the Planning Board to recommend the Town Board approve a Planned Development District, which would permit more density than the current Single Family Residential zoning allows, which in this case is 38. Shortly before the board was going to vote on a recommendation, either yes or no, Daniel Radtke, his attorney Joseph Zippone, and his engineer Nicholas Costa went out of the room for a few minutes and when they came back and asked the board to table the project while they presumably re-worked the plan. This is the second rendition of the project on 23 acres of land between Rustyville and Wolf roads. The first, presented in June 2018, included 204 market rate apartments in three-three story buildings, the assisted living facility and 1,500 square feet of retail space. The PDD must include a public benefit and in this case Radtke is proposing to build a road that would connect the traffic circle near Maxwell Road and the one near Aviation Drive and deed it and some seven acres of land to the town. It would be worth some $2.7 million and alleviate some traffic at the northern end of Wolf Road, one of the most congested in the Capital District. Other changes from last year include removing the gable roof and installing a flatter roof to make the building stand about 41 feet rather than nearly 59 as originally proposed. Along the Rustyville Road side of the project, where there would not be a parapet wall, it would stand 35 feet or about the same height as a Victorian home. There would also be substantial buffers build along the existing neighborhoods that include berms and trees to make it harder for residents there to see the buildings. The vast majority of the apartments will be studio and one-bedroom. 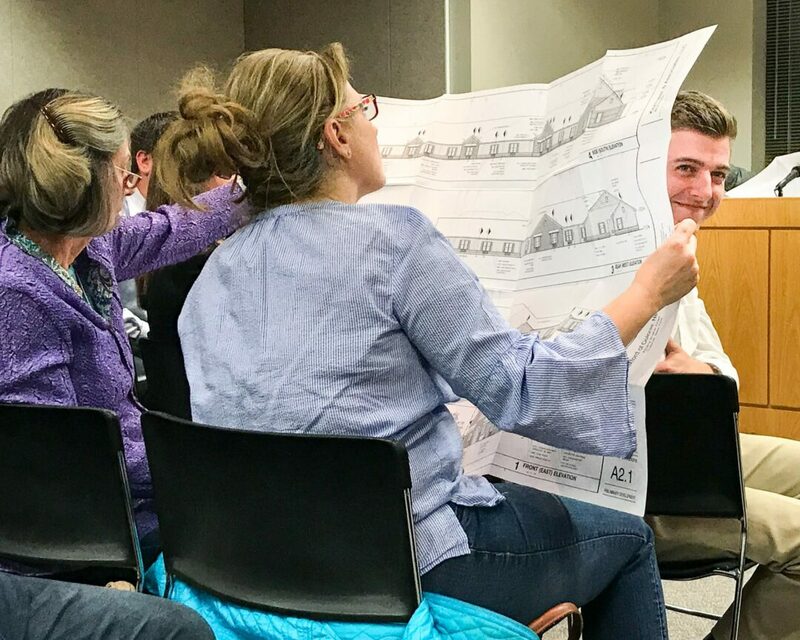 The public, by and large, did not like the plan then and despite being substantially smaller, didn’t like it much at the public hearing on Tuesday, April 9. There was also a petition opposing the project and on Monday, April 15 nearly 250 had signed. Stephen Grady, a Rustyville Road resident reminded the board it denied the developers of Fogarty Farms just down the road a PDD to build 80 units, which represents twice the allowable density. The town has long wanted the connector road, but Mary Beth Buckner asked if a road would still be constructed if there were single family homes. Joe Grasso, the town’s designated engineer, if single family homes were built there it would need a road system but residential roads are different and about half the cost as industrial roads. They also accommodate less traffic and do not hold up as well. Increased traffic, though, was at the top of everyone’s list of concerns. Two residents spoke in favor of the project. Michael Seiznat said he has a number of family members living in the area and that his grandparents did not have anywhere close to go as they age. The board members, by and large, were still not happy with the size of the project. While the board and the public were not as opposed to the assisted living portion, many still felt it was too close to the Rustyville Road residents. It’s unclear when the project will come back before the Planning Board or how much it will be changed from the latest iteration.